Cindy Alexander is taking her talents directly to YOU! 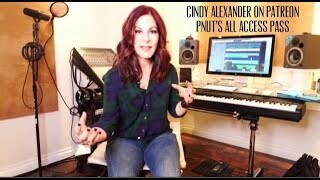 Cindy Alexander on Patreon ~ Pnut’s All Access Pass! Patreon, an amazing platform for artists that provides a richer experience for music fans, is an all-access pass into the making of new records, behind-the-scenes content, and life in between the songs. What will Patreon offer you? -You will receive demos before the actual commercial recordings. -You will see first-hand Cindy’s song writing process, what her works in progress are, what songs she has covered, and why she covers them. The content on this site will be EXCLUSIVE and not found anywhere else on social media. Become a “Patreon” by clicking here.